To heat up lead generation without relying on the business-chilling effects of cold calling, many of today’s companies are deploying a variety of innovative new online tactics and tools—from sales calculators to knowledge centers and lists of people who want to buy now. These lead-gen options can give you a more powerful way to reach out to potential customers, interact with them and educate them about your solution. Create a Savings Calculator—Show Prospects Your Worth. Among the goals of lead gen is to answer prospects’ questions and help them see how your solution can solve their problems. Among their questions is how the solution will help them save money, reduce man-hours, or achieve a viable ROI. A great way to help them find the answer is to provide an interactive savings calculator. They can enter their data and get an instant response. The right answer could give them the push they need. 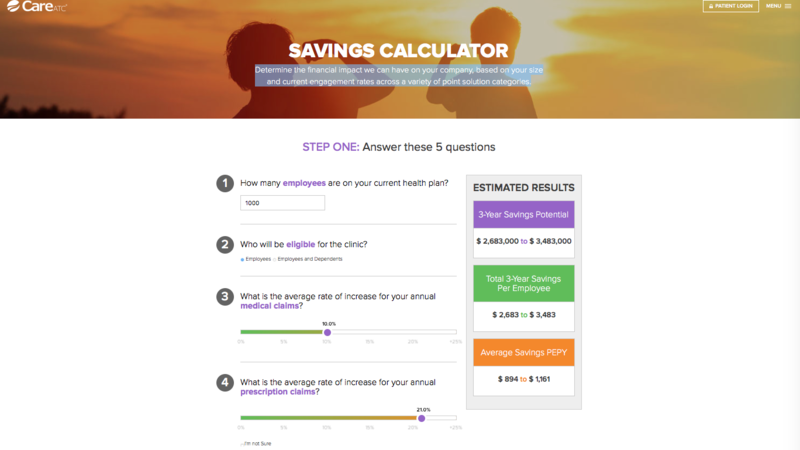 CareATC offers prospects a savings calculator for its workforce wellness solutions. The calculator helps them determine the financial impact the company can have, based on a potential customer’s size and current engagement rates across a variety of point solution categories. Add Appointment Scheduling—Give Prospects the Power. Sometimes solving prospects’ pain points means giving them power—in this case, the power to make appointments quickly, easily and conveniently. Integrated appointment scheduling apps deliver this capability. Scheduling apps allow prospects to book appointments directly into a company’s calendar on their own schedule. Sales reps get a huge benefit as well. They save hours of time going back and forth with prospects to find the best time to talk. For example, HubSpot meeting scheduling software lets users “forget the back and forth emails.” Instead, prospects can simply click the day and time that works best for them. These apps replace the tedious, old-school process of identifying, qualifying and booking appointments with qualified leads. As a bonus, when a prospect takes the initiative to book an appointment on their own using your company’s appointment scheduler, it means they’ve looked at your availability, checked their calendar, and carved out time in their schedule for a serious conversation about your services. That’s a high-quality lead. Here’s another example. 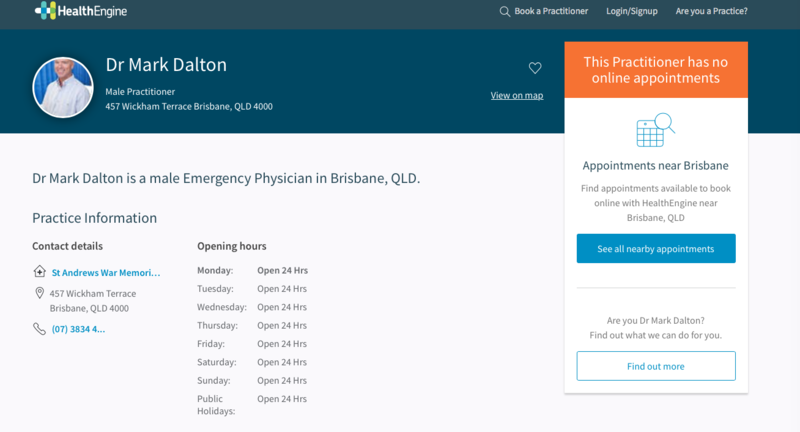 Medical professionals on the HealthEngine website can use an appointment scheduling app—and put the power into patients’ hands. Build a Knowledge Center—Answer Prospects’ Questions. When it comes to answering prospects’ questions and objections to your services and products, there’s nothing more powerful than offering them a knowledge center. It presents a nearly unlimited opportunity to achieve a wide range of lead-generation goals: answering prospects’ specific questions, showing them how products work, giving them confidence in your solution, sharing relevant insight with their decision team, and more. Knowledge centers are powerful lead-gen tactics because their contents support SEO. And Google loves helpful content. As a result, you gain the ability to reach more “cold” prospects, including those who may be unfamiliar with your organization. 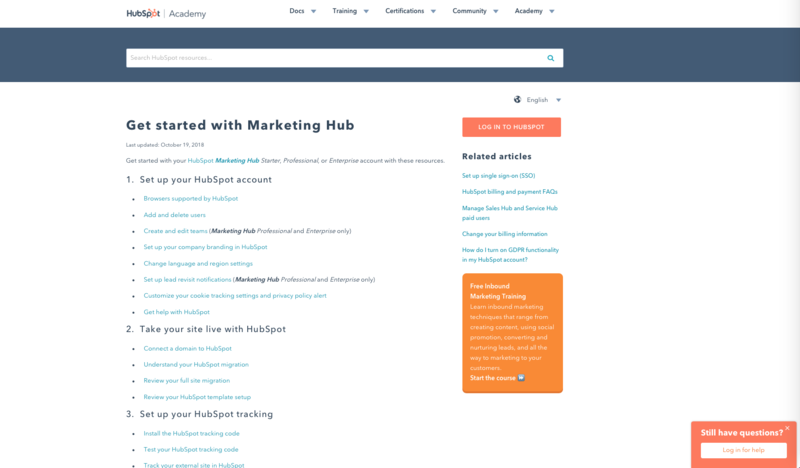 HubSpot Academy’s knowledge center is a perfect example of this idea in action, because it is designed to answer prospects’ most common questions—on everything from setup to using the marketing tools—in one convenient location. Offer a Free Email Course—Educate Potential Buyers. Another way to help educate prospects and transform them into leads is through free online courses delivered via email. Email courses are opt-in lead-magnet emails containing a series of lessons delivered over a prescribed number of days. A well-developed email course on a relevant topic provides prospects new insight on issues related to your products and services. As a result, your course will prepare them to become ideal buyers. 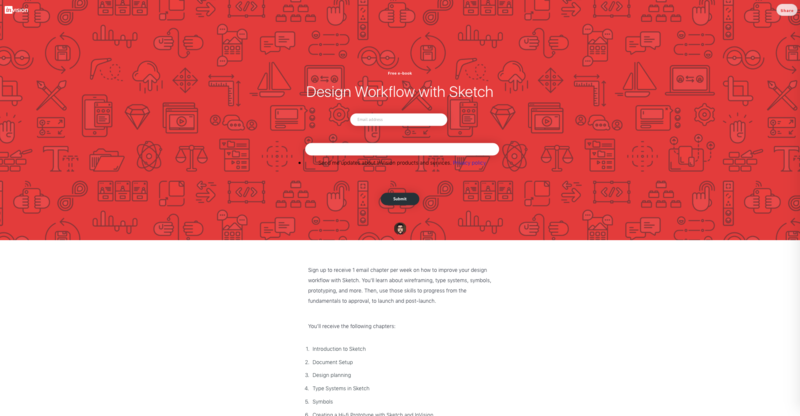 In this example, InVision delivers 10 free lessons on using its product along with Sketch to bring efficiency, consistency and speed to your design workflow. Encourage Customer Reviews—Be Found by Prospects. A Google/CEB study found 71 percent of B2B searches start with a generic keyword phrase. Those searches often lead prospects to customer review sites, because Google recognizes their independent role in helping people find what they’re looking for, and favors reviews in its search engine results. You can increase your presence on review sites by requesting satisfied customers leave reviews. When they do, you increase your chances of being found via search by qualified prospects. Appearing on review sites puts your company in what McKinsey calls the “initial consideration set,” which leads to the “moment of purchase” during the consumer decision journey. 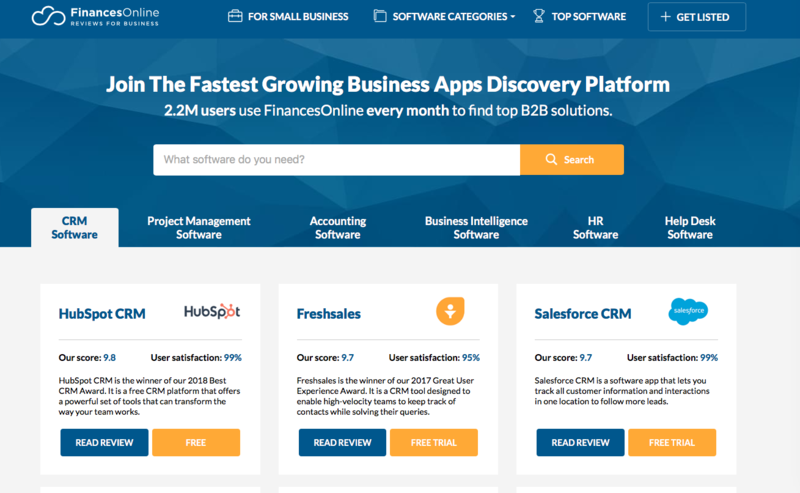 FinancesOnline.com is an example of a successful B2B review platform. Over 2.2 million people use the site every month to find B2B finance solutions in a wide variety of industry categories. While this is an example of a niche review site, there are many others out there. Finding ideal niche review sites for your business gives you a whole new source of leads for your marketing process. As a result, searches for your solutions will expand beyond the typical search services, like Google and Facebook. Create a Quiz—Give Them a Challenge. Quizzes are nearly irresistible sources of content. 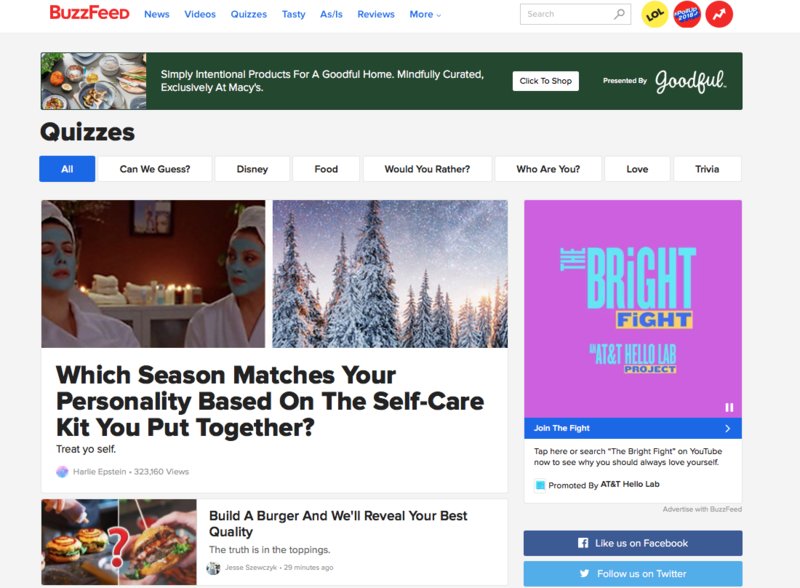 Just ask companies like Buzzfeed that leverage the power of quizzes nearly every day. People love them. But companies should too, because they hold the power to both draw in new prospects and provide sales teams with valuable insight they can use to seal the deal. When well designed, quizzes are irresistible to a target audience of people who love a challenge. Plus, their content can both educate prospects about the state of their current situation and about the solution that can solve their challenges. Quizzes also meet B2B prospects’ desire to access interactive or visual content on demand. DemandGen Report’s 2015 Content Preferences Survey found that this includes 86 percent of marketers’ goals. So if you want a great way to generate new leads, join BuzzFeed and other organizations that have attracted thousands of leads with interactive quizzes. Launch a Micro Site—Target With Precision. 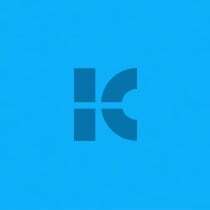 All companies have a website. But some companies have also launched one or more microsites. These are individual webpages or small clusters of webpages that act as a separate entity for a brand. A microsite typically lives on its own domain, but some exist as subdomains to the main website. Microsites can be used to help brands achieve a number of things. For example, some companies have used them to highlight a specific campaign or target specific buyer personas. Others have used them to tell a short story or to inspire a specific call-to-action. 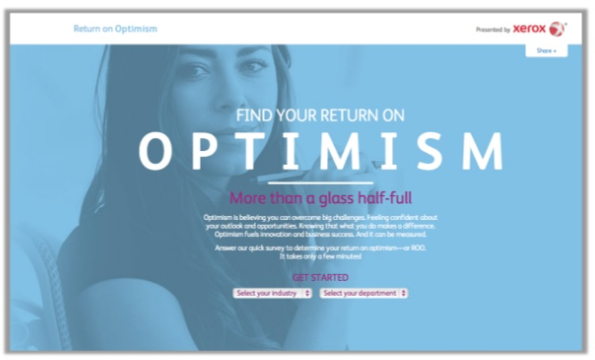 Xerox created a microsite offering relevant tips to business owners in a campaign called “Get Optimistic.” The results were significant: 70 percent of the companies targeted interacted with the site; readership increased 300 to 400 percent over previous email campaigns; 20,000 new contacts were added to the pipeline; over 1,000 new prospects scheduled appointments; and the value of the appointments exceeded $1.3 billion in revenue. 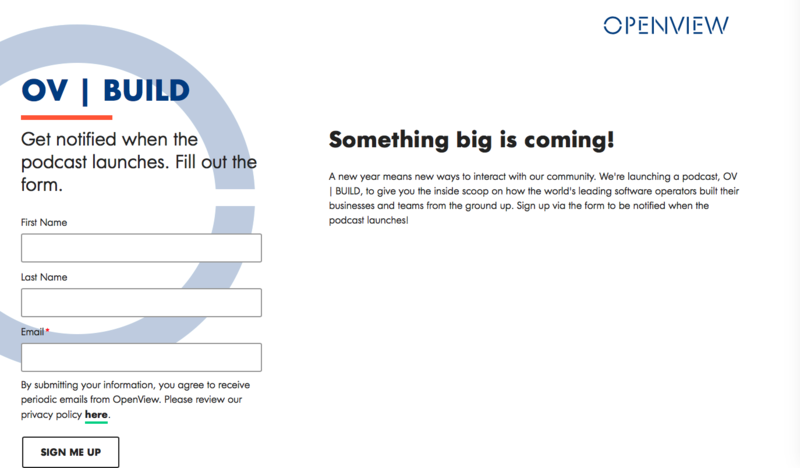 Launch a Podcast—Get in Their Head. Although it’s one of the newest forms of marketing, podcasts are all the rage—with more launching every day. Podcasting is a powerful marketing tool because it gives companies a way to consistently and deeply get into prospects’ heads, while creating an appearance of subject-matter authority. Buy Lists...That Include Buyer Intent Data. Blocks of time spent cold calling purchased lists that include common contact and company demographics such as industry, company size and job title has worked for years, but it’s time-consuming—and you have to make a lot of calls to find the precious few who are actively researching and open to considering making a purchase in the near future. New advances in technology have made it possible to get lead lists with intel beyond the basic demographics. Now prospect lists are available that show when someone is researching your competitors or industry news for a solution you provide. This Buyer Intent Data is now available; click here to schedule a demo! Whether you launch a free course or a podcast or some other innovative lead-gen tool, these online prospecting tactics will deliver significant marketing and sales benefits—including giving prospects content they can consume on their terms and the chance to make deeper personal connections with your brand. Plus, you gain the opportunity to heat up your prospecting around the clock.